But one of the biggest unanswered questions is a variation of the “My dad's better than yours…” hypothesis. Which is better, the Defiant or the White Star? It is an endless argument. 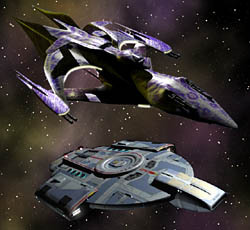 Some feel that the White Star’s adaptive armour would provide the advantage, whilst others would dispute this, saying that the combined shields and ablative armour of the Defiant would be better, especially when combined with the stand-off range of the photon torpedo. But then at close range… I could write a whole page. Alternatively, we could try it out and answer the question once and for all. The two vessels are situated ten hexes apart in the centre of a floating map. They start with all weapons off, all shields lowered, no adaptive armour pre-set, and all jump engines/warp drives deactivated. They are facing away from each other (stern to stern, or back to back for you non-naval types) and are not moving. They are starting in the same situation. No ramming, no fighters or shuttles, no upgrades. Also no jumping/warping. We are trying to test a theory here! Do you really need it spelled out? Eliminate the opponent as a threat. This means either obliterating it, or completely disabling it.